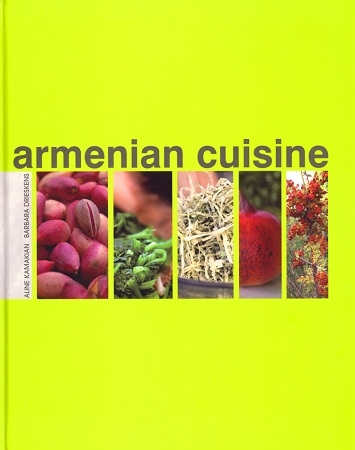 Armenian Cuisine is a modern, glossy cookbook with over 130 of the most popular and delicious Armenian recipes. The dishes are packed with aromatic flavors and ingredients that combine to make mouth-watering and authentic meals. Aline Kamakian, a passionate cook and the co-owner of Mayrig Restaurant in Beirut, traveled with writer and anthropologist Barbara Drieskens to her ancestral village in Cilicia. Here they gathered stories, recipes and vivid images that add to the overall appeal of the book. Clearly described recipes are accompanied by their Armenian names and a beautiful, artistic image of the dish in its various stages. Informative anecdotes, helpful cooking tips and passages about Armenian history and culinary traditions make Armenian Cuisine more than just an ordinary cookbook.